Welcome to Moondance Childbirth Services. 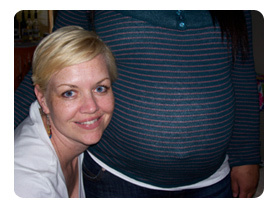 My name is Tammy Leeper and I offer labor & birth doula services. I serve close to all areas in Los Angeles and Orange County. Please contact me for the specifics! For hundreds of years, women have been supported by other women when giving birth to a baby. A "doula" (also known as a childbirth or birth assistant, labor support professional or birthing companion) is simply that - a woman who provides continuous emotional, physical, non medical and informational support during pregnancy, labor, birth and immediately after the arrival of newborn(s). A doula does not replace the partner. Instead, she enhances the support of the partner so that he or she can be there for and love the laboring woman. A doula helps to take the pressure off of the partner to allow them to enjoy the experience. The doulas role is to assist with the transition from being pregnant to being with your baby after its journey to this world.